Until I become a mom, I was clueless to range of special needs some children face on a daily basis. To some a shirt with lots of fancy buttons or bedazzling glitter is a must have. But for some kids, this type of shirt could cause all sorts of problems because of tactile sensitivity. Knowing a number of families who are impacted by tactile sensitivity, I have a greater sense of appreciation for products that make life just a little “simpler”. That’s why “pint sized fab” loves Teres Kids. This is a kids clothing line made especially for young children who simply need more basic clothes without all the frills – but still look just as adorable. The clothes are basic, yet comfortable – full of color, but not too much. I love, love, love the pint sized yoga pants!! 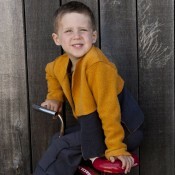 Our other favorite picks are the belted sweater for girls and the open front cardigan for boys (both shown below). So this holiday season, if you know of someone who could use a little something special for their boy or girl who live with tactile sensitivity – here’s the perfect line for you to find a gift. The fall/winter line has a Parisian/Bohemian theme. FAB! !